At the permanently busy bazaar square in lower Kiev, Zhitniy Market is buzzing. The market’s building is a stunning example of late Soviet modernism from 1980: a concrete ceiling is hanging on four pillars like a cloth and the daylight pours into the massive open space through glass walls, slightly tinted with dust. For the few hundreds of people working at Zhitniy, it’s just another day: ladies in thick blue aprons keep selling meat and dairy from their stalls, and numerous kiosks and shops are trading in everything from pies to coffees to cheap replicas of Ukrainian national embroidered shirts and sportswear knock-offs. At the same time, the upper level of the market, hanging over the space like a brutalist balcony, is engulfed in another kind of movement – it’s the set for Anton Belinskiy’s SS18 show. For a few hours, this is the centre of the city’s cutting-edge cultural scene, drawing some amused looks from the local sellers. At first glance, Anton Belinskiy’s new collection – modelled by a crop of Kiev’s cool kids (some cast by independent agency Cat-b) – is a complete mishmash, just like the surrounding market. But if you take a step back, the combination of abundant floral prints, uniform-style pieces, effortless sportswear and voluminous shirt tailoring slowly starts to make sense. Like the visual and material culture of contemporary Kiev, it’s fast, in-your-face, irresistible – but in the case of Belinskiy, also lined with intricate artistic vision. Meanwhile, downstairs the market workers continue chopping raw meat, and a small group of middle-aged women in work clothes (the show was open for everyone) giggle at particularly revealing outfits. In the background, angular pillars are painted electric blue, not unlike the blue of the Ukrainian flag. It creates a visual parallel with a few garments – the national colours, just like the theme of Ukrainian identity, have always been crucial for Belinskiy’s work. At 29, Anton Belinskiy has run his fashion label for six years now, and had a taste of international recognition with a nomination for the LVMH prize, a show with VFiles in New York, a handful of international stockists, and two presentations at the Palais de Tokyo during Paris Fashion Week. 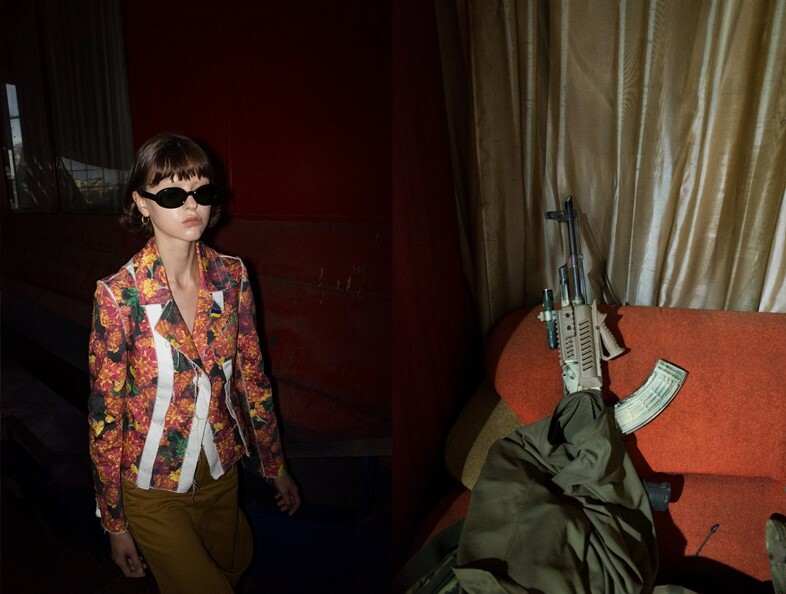 The designer’s success also goes beyond fashion: he participated in the 57th Venice Biennale this year, as part of Ukraine’s pavilion curated by cult photographer Boris Mikhailov. The SS18 collection, in fact, is a continuation of his extensive research into the material culture which surrounds political power in Ukraine, which Belinskiy started for the Biennale. In the last few years, Belinskiy’s voice has been a great consolidating power for the creative scene in his native Kiev. This season, he showed in the city independently, in the framework of his initiative One Day Project, which united Ukraine’s most cutting-edge fashion talents. Other One Day Project participants included Yulia Yefimtchuk, with her radical take on uniform and socialist aesthetic; Drag&Drop with their subversive femininity; and CSM-graduate Masha Reva with her latest hybrid collection of fashion design and drawing. 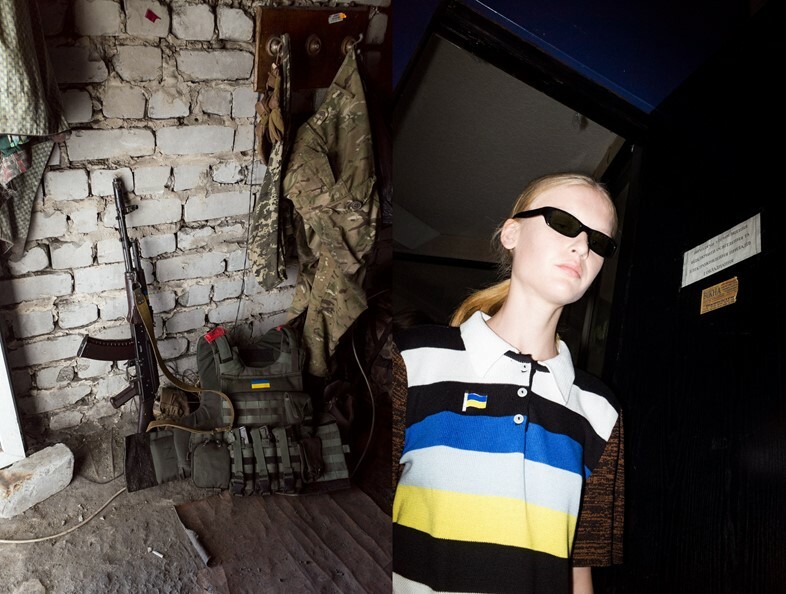 But what makes Anton Belinskiy a truly special case is the fact that his attitude to fashion resonates with the emerging generation of Ukrainians. It’s not just about success or individual style – for them clothes, just like photography, art, music and rave culture, are a tool for creating a new identity and making a global statement. Three years on after the revolution of 2014, the desire to be heard only intensified, as so did the yearning for global connection. Today on the streets of Kiev, Ukrainian flags are often flowing next to the starred banners of the EU. This year Ukrainians were granted visa-free travel to Schengen countries, and they’re looking towards the West with hope – just as the whole post-Brexit world is debating the very idea of Europe. Tapping into the conversation, Belinskiy produced a capsule collection of EU-themed garments in collaboration with Eurotic for his presentation at Paris Fashion Week. Yellow stars on the blue background represented hope, but also the fear of being sidelined as the Europe’s political underdog, not unlike Greece. For the young generation of Ukrainians, it is indeed a challenging time. Caught in between two grand historical entities – the Soviet Union in the past and united West in the uncertain future – they’re witnessing a great change their country is going through. But Anton Belinskiy’s work proves, they will never be silent again.